The survival prospects of one of the world’s most threatened and evolutionarily distinct amphibians have just received an enormous boost in the shape of a new community-based protected area in Ghana. The scientific justification for the creation of this crucially important sanctuary – formally gazetted by the government in September 2018 – was based largely upon the findings of a team of Ghanaian biologists whose research on the evocatively named Togo slippery frog was supported by the Conservation Leadership Programme (CLP). 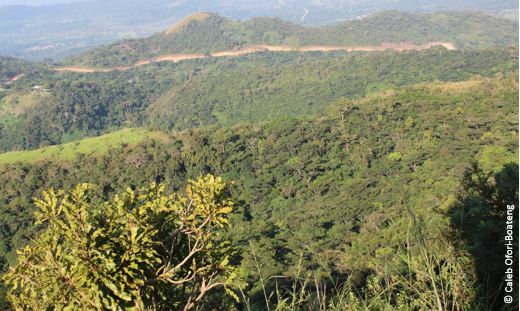 The 350-hectare Onepone (pronounced oh-nay-poh-nay) Endangered Species Refuge, named in honour of the two communities who donated land to enable its creation, will safeguard one of the last remaining forest fragments in the so-called Dahomey Gap – the savannah corridor that separates the Upper and Lower Guinean forests. Between them, these two vast blocks of West African rainforest comprise one of the world’s most valuable – and imperilled – havens of biodiversity, home to more than a quarter of the continent’s mammal species and countless other plants and animals. The islands of remnant forest dotted throughout this swathe of savannah harbour species that are found nowhere else on the planet, including the critically endangered Togo slippery frog. A close relative of the more familiar goliath frog – famed as the world’s largest – the Togo slippery frog is now believed to be restricted to the Togo-Volta Highlands, the forested hills that straddle the border between Ghana and Togo. It was here, in 2013, that Dr Caleb Ofori-Boateng and his CLP-funded project team embarked on a multi-pronged conservation effort to rescue this neglected and extremely rare amphibian from the brink of extinction. At this point, Caleb and his fellow frog enthusiasts were operating under the collective banner of Herp-Ghana. This organisation began life in 2006 as a small conservation interest group at Kwame Nkrumah University of Science and Technology, but has since metamorphosed into a leading Ghanaian NGO that spearheads the conservation of amphibians and reptiles throughout West Africa. 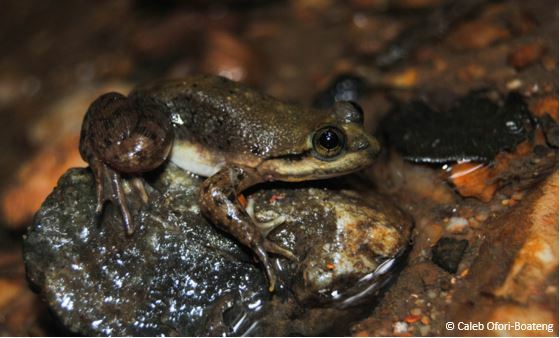 The team’s earlier CLP project, funded by a 2010 Future Conservationist Award, had focused on what was then considered to be the only viable population of the Togo slippery frog – in Ghana’s Atewa Mountains – which was threatened by habitat destruction as a result of bauxite mining, but recent research has revealed that this is almost certainly a completely different species. 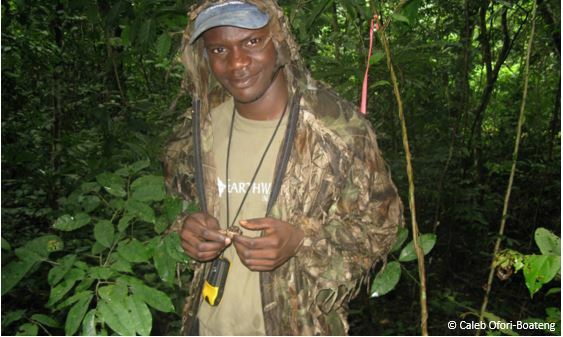 Three years later, with the help of a CLP Follow-up Award, Caleb and his team switched their attention to the Togo-Volta Highlands, where this slippery frog was on a slippery slope, thanks to a perfect storm of rapidly expanding human settlements, widespread logging, slash-and-burn agriculture and a roaring trade in bushmeat. With CLP support, the award-winning team devised and implemented a suite of conservation measures that included a comprehensive species status review, targeted habitat restoration, training of local conservationists, provision of livelihood alternatives, and an awareness campaign aimed at transforming local attitudes towards an amphibian that was previously perceived as a protein snack. 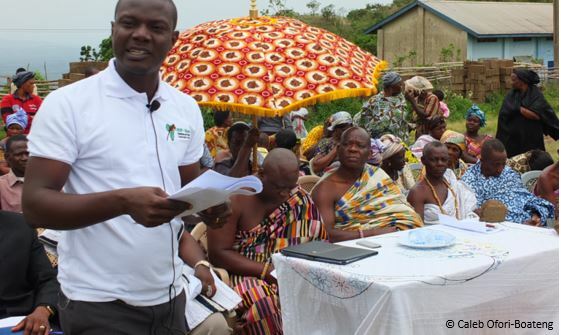 Crucially, by engaging with a broad range of stakeholders – and with local communities in particular – Caleb and his colleagues played a pivotal role in building widespread support for the creation of the new protected area. The Togo slippery frog is just one of numerous threatened species that stand to benefit from the increased protection afforded by the newly designated reserve. Other species that share its dwindling forest habitat include the critically endangered hooded vulture, the endangered Ukami reed frog, the beleaguered black-bellied and white-bellied pangolins – victims of the rocketing demand for their scales in traditional Chinese medicine – and a veritable kaleidoscope of endemic butterflies.